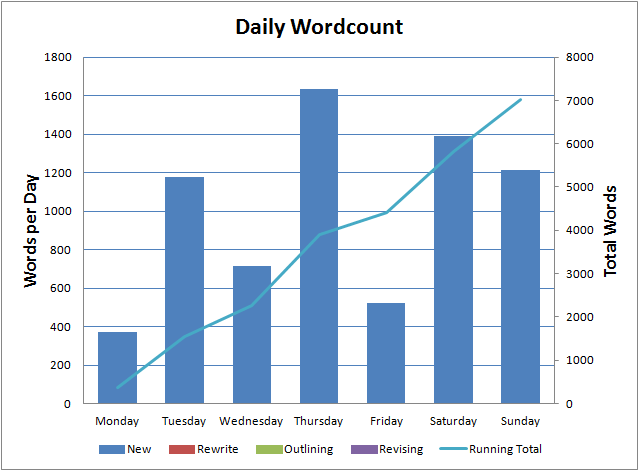 This is the last week I’ll be trying to maintain my 1,000 words a day average. I cranked out 7,020 words on The Zombie Book, which is good. But I find that when I start focusing on word counts too much, they become the most important part of the writing, instead of the story. When I come back to edit the writing, I discover rambling sections where I was writing to hit the word count, not to tell the story. It’s the reason I don’t set word count targets beyond writing something every day. For some people, that daily minimum word count is a good motivator to write fast and it doesn’t matter how bad the writing is, they’re happy to come back later and fix it up. But for me, the write every day edict is enough and I don’t like finding great swathes of directionless rambling in my manuscripts when I go back to edit them. I already know there’s several scenes that are going to be axed from The Zombie Book when I go back to revise it. In general that’s not an uncommon “problem” to have, but still, I’d like to do everything I can to avoid them. That means I sometimes need to stop writing and spend some time mulling over where the story goes next and I’m reluctant to do that if I’m trying to hit an arbitrary word count goal. So, I’m abandoning the 1,000 words a day streak. It would probably happen naturally anyway. There’s only about 8 chapters left to write in The Zombie Book (which means it’s going to a longer book than expected) and once that’s done, I’ll have to spend some time revising and outlining something new which always results in lower word counts. So from now on, if the 1,000 word average streak lives, it lives. If it dies, it dies. And if you’re wondering, yes, my first three indie releases are still available on an Amazon near you.